The University Career Development Center in collaboration with the College of Engineering and Fulbright College will host the Science, Technology, Engineering, and Math (STEM) Career Fair from 10 a.m. to noon and 1-4 p.m. Wednesday, Sept. 26, in Bud Walton Arena. 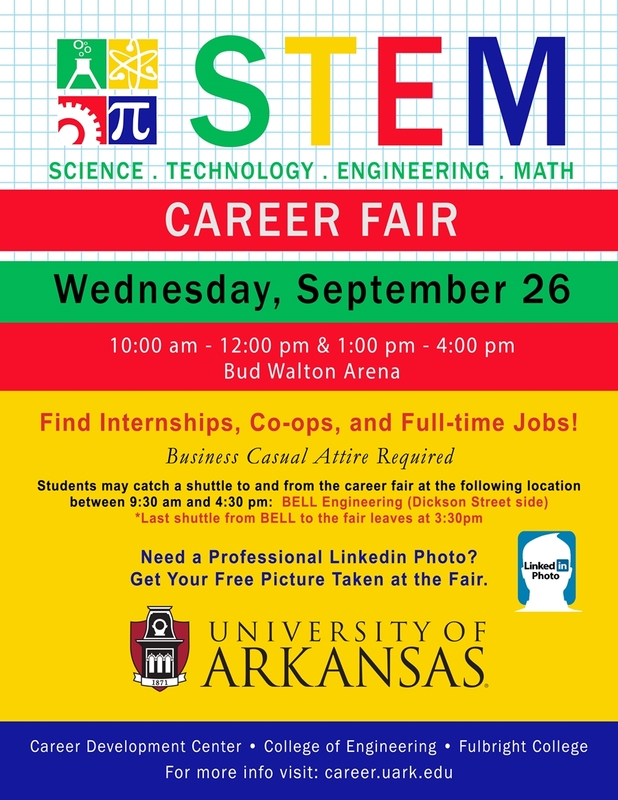 The STEM Career Fair is designed for all University of Arkansas students majoring in the science, technology, engineering, and math, the STEM fields. However, any student interested in working in any of these fields is also invited to attend. A variety of employers from around the country will be in attendance to meet, network with, and potentially hire talented U of A students for their internships, co-ops and full-time positions. Students are encouraged to attend the STEM Career Fair to identify employment opportunities, expand their network, polish their interview skills, learn industry information, and gather information about companies. Students may also get their professional photo taken at the fair for free. These photos may be uploaded as a Linkedin profile photo. On Thursday, Sept. 27, the University Career Development Center will also hosts "Day after Career Fair Interviews." Students may walk away from the career fair with interviews the very next day. It is important for students to prepare for the STEM fair and to bring several copies of previously reviewed and revised resumes. Students can have their resumes reviewed by attending the Career Center's Drop-in Resume Review scheduled from 10 a.m. to 2 p.m. Sept. 24-25 in the Arkansas Union International Connections Lounge. Students may also drop in for a brief 15-minute resume review prior to the fair from 9 a.m. to noon and 1-4 p.m. on most Wednesdays. For more more information regarding our Walk-in Resume Reviews, visit career.uark.edu. Students may catch a shuttle to and from the career fair at the following location: Bell Engineering (Dickson Street side) from 9:30 a.m. to noon and 1-4:30 p.m. The last shuttle from Bell to the fair will end at 3:30 p.m. Prepare for this fair and find a list of companies that have registered to attend by visiting https://goo.gl/y7PyCU. The STEM Fair is co-sponsored by Walmart, J.B. Hunt Transport Services, Tyson Foods, Consumer Testing Laboratories, ConocoPhillips, Eastman Chemical, and Phillips 66.